PRNewswire: Changhong H2 smartphone features a spectrum analyzer inside. Changhong has worked closely with Consumer Physics and ADI to develop and manufacture this first-of-its-kind smartphone. 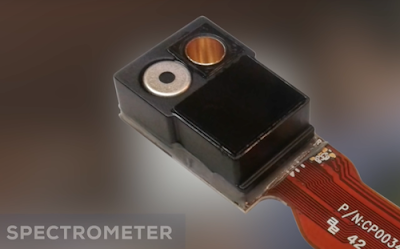 Since collaborating in early 2016, ADI and Consumer Physics have been committed to miniaturizing the SCiO sensor for integration into a wide variety of connected devices. "Changhong H2, with the integrated, miniaturized near-infrared spectrometer, marks a huge step forward for connected devices and makes it possible to see the physical world around us like never before via a mobile phone, which is the most common smart device in the world," said Martin Cotter, SVP, Worldwide Sales and Digital Marketing, Analog Devices. Makes me want the SCiO on the Note 8. Can a lab spectrometer with controlled lighting already analyze body fat and strawberry sweetness? I think that would be amazing by itself. As far as I understand, they do not directly determine fat and sweetness. Rather, they are trying to identify the object by its spectrum. Once identified as a strawberry of some specific type, they just give you a sweetness of this type from their database. Building a large database is a significant part of their work. I'm not particularly fond of products like this. The number of variables is so high that the amount on analytics required to give a result suitable for the public will be enormous and for what, the level of sweetness or body fat. Further, using surface data says little about what is within a thicker material, they site medication but for the most part it will just pick up that a pill is blue or white, or that a capsule is red. My issue with this is not the spectroscopy, or the data, it is more the time, effort, materials, recycling chain and analytics required to take a spectra full of noise and unknown factors and to distill it down to something reasonable. A strawberry is sweet, we know that anyway. Medication should always be purchased from a reputable supplier. So at the end of the day this, albeit very smart chip and back end database, will be in a phone with a usage lifetime of 18 to 24 months. How much use during that time vs the cost and ultimately will it be easy to reclaim the materials used? IMOH this is no more logical than upping the phone camera MP count before improvements in optics. Surely we should concentrate on more pressing needs? You drastically underestimate the penetration depth of near-IR, with esp. biological tissue absorbing only very little. Your reference to "surface data" is simply wrong. Further, your mindset seems quite narrow if you only think this was developed to tell you how sweet your strawberries will taste. What about detection of allergenes, e.g. in an restaurant environment where you will not find a list of ingredients below your plate or for supporting people that are unable to see, unable to read or to smell (yes this also exists).